Assess your potential as a candidate and/or start planning a run for office. 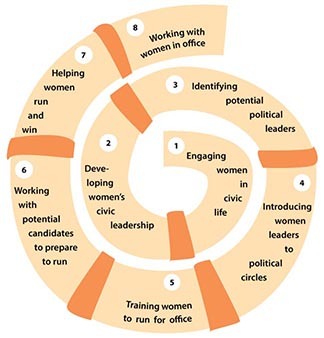 Organizations and individuals provide personalized attention to women thinking about running, including assessing districts and races and helping them and their team launch campaigns. Carin Schiewe works with campaign teams and aspiring progressive candidates to assess potential runs for office, including personnel, district and opposition research, and analysis. She supports candidates and teams to develop short and long-term plans for building name recognition, developing community support and increasing civic leadership skills and resources. Emerge Massachusetts works one-on-one with women who are or have been part of its 6-month training program to help them prepare for future campaigns. Mass Alliance conducts the Getting Ready to Run Training every year to help progressive candidates gear up for campaigns. Mass Alliance staff also meets with women one-on-one, often over a period of months or years, to help them prepare themselves, their families, and their teams to run a successful campaign. MWPC PAC works informally with individual women to help them prepare to run and assess opportunities. Neighbor to Neighbor Massachusetts provides in-depth leadership development, campaign planning, and strategy support to prepare potential candidates to run for office. ¿Oiste? The Latino Political Organization provides early guidance on request to Latina/o candidates in assessing changes of winning, including analysis of voting trends, district profile, and opposition. ¿Oiste? also advises candidates about how to build campaign teams.